You are here: Home / Uncategorized / Pampers Love, Sleep and Play – big REVEAL in NYC! This is part of a compensated campaign with Latina Mom Bloggers and Pampers, however, all opinions expressed are my own. A few weeks ago I told you about Pampers’ Love Sleep & Play campaign, which celebrates the millions of ways babies uniquely experience love, sleep and play. Remember? Love: whether it’s a hug from an older brother or sister, a kiss from their parents, or a tender embrace from their grandparents. Throughout the last month, Pampers asked parents across the country to submit photos of their babies experiencing love, sleep or play to the Pampers Facebook page for the chance to be featured in their big celebration. 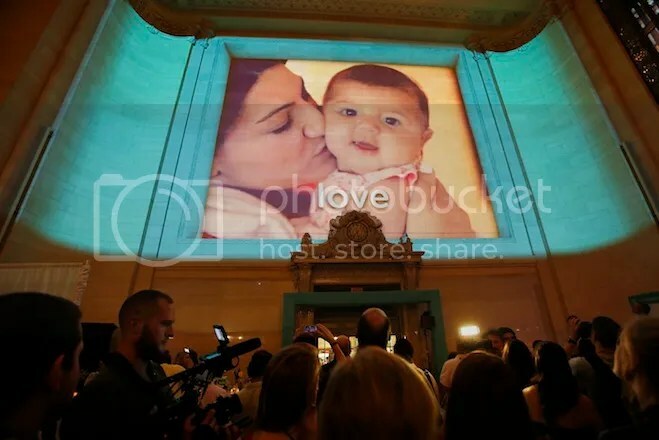 To honor these priceless love, sleep and play moments, Pampers placed babies across the country center stage, hosting a special event on August 21st in New York City’s iconic Vanderbilt Hall at Grand Central Terminal. The historic site (it’s amazing! ), which is celebrating “a century of arrivals” this year, was transformed as the littlest of arrivals (babies!) helped to unveil a first-of-its kind, user-generated baby photo experience. More than 30,000 photos were submitted! 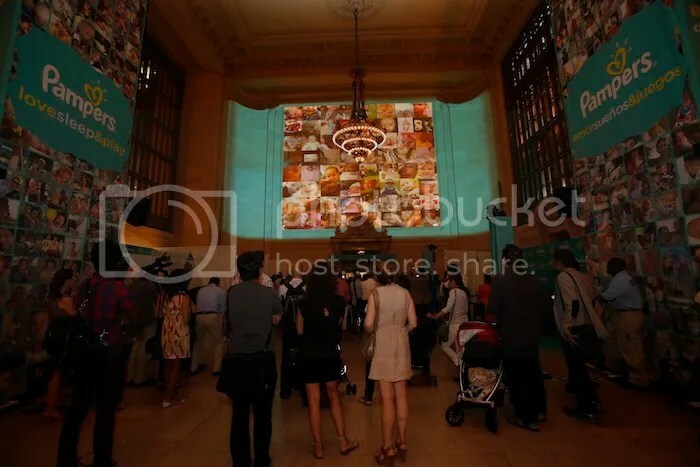 Pampers compiled the images into a larger-than-life 3-D photo installation. Mother-to-be, actress Jennifer Love Hewitt and Mexican actress and TV host, Jacqueline Bracamontes, were on-hand at the event to walk the “teal carpet” and help Pampers reveal the display while celebrating the millions of unique ways babies experience love, sleep and play. Pampers understands that the how, when and where love, sleep and play are displayed isn’t what’s important; what’s important is the unique and joyful ways each baby delights in their own experiences – so who better to be in the spotlight and reveal the campaign than little ones themselves? They’re all SO cute! To learn more about Pampers, please visit www.pampers.com and facebook.com/pamperslatino. To enter, fill out the Rafflecopter below. As your mandatory entry, you must watch the Pampers Love Sleep & Play NYC Video above (http://youtu.be/LzjFbAjOKpk) and leave a comment below telling me the unique ways that your little ones express love, sleep or play. GIVEAWAY RULES: Giveaway is only open to US residents (48 contiguous states) 18+ and up. Entry period ends at midnight on Friday, September 13th. Good luck! Running the PTO auction for my children’s school made me stronger and made me realize a lot of skill I never even knew that I had. Thanks for being the first to enter, Kerrie! 🙂 I had accidentally left the question from my previous giveaway, I apologize. All fixed now, but your comment still counts! It is time to play when they attack and jump on my feet when they move under the covers. My son will rub my back when I am sick – so sweet! Our baby boy sleeps with his feet straight up in the air, its so cute! doesn’t look very comfortable, but that’s how he falls asleep! He always snuggles and he loves kisses! My grandson loves to play by making funny faces with me and laughing! I always seem to find my daughter hanging off her bed or couch when she is sleeping.. Looks so uncomfortable! Thanks for the chance. My son won’t go to sleep without snuggling. My Baby Expresses Love By Giving A Ton Of Hugs And Kisses! My grandson plays by rolling all over the entire living room. My sweet lil one loves to snuggle and that smile and laugh just make my day. Such a joy!!! My daughter squeals every time my husband comes home from work! It really makes you feel loved! My little one expresses love by showering her baby brother with kisses- usually more than he needs. The love of a child is so beautiful, so innocent. My son usually takes a while to get to sleep but he is just so darn cute once he is finally passed out, He loves sleeping on his belly in odd positions. Our newest little ones has just learned to out-stretch his arms and motions with his hands to come here…. I just love it. It makes me feel so needed. I love how my granddaughter would nestle her head on my daughter’s neck. our little one falls asleep after playing on the big pillow on the floor, so comfy. My son loves to play by chasing the kitty cats around the house. My daughter always sits next to me, and holds my hand when we are walking. Our daughter sleeps in a “superman” pose with her arms and legs stuck straight out. My daughters talk in their sleep! It’s so cute! She always snuggles and tries to soothe me when I’m down…melts my heart! My son just learned to say I Love You! He also loves to sing Happy Birthday! My little granddaughter will call me and tell me all about her day and will always tell me she loves me. My little one turns into an inch worm when she sleeps swaddled in her crib. Starts at the top of her mattress every night and wiggles down to her feet touching the bottom by morning. Don’t know why but its soooo cute!! my niece and nephew express love in various ways. My niece can talk, so one thing she does is call her grandparents by “pet” names. it changes from things like monkey to papaw, etc. my son bounces on his hands and knees and gives the cutest little smirk when he is ready to play! My 16 month old son gives me kisses and “hugs” me by putting his head on my shoulder and squeezing slightly….so cute! He usually starts tugging his ear and rubbing his eyes when he’s sleepy. DS4 is getting so tall but he loves to say, “Mommy, let’s snuggle!” and then climb in my lap with his doggie in hand. We’ll need a bigger chair soon if he keeps this up. Our oldest (20months) is ALWAYS hugging on and kissing his newborn brother. He shares his toys and FOOD with us lol. I love it when my little ones snuggle closely into my chest, letting me know they feel safe and secure with me there. And of course hugs are awesome too! He’s only 6 weeks old, but he loves to snuggle! my little guy will run and bury his face in my tummy! so cute! my little one give the best hugs and snuggles! Malia´s last blog post ..Baby Shower Gift Guide GIVEAWAY Extravaganza! I think my niece expresses love through her giggles! My daughter hugs me and says “Mommy, you’re my best friend”. we play peek a boo and i love hearing those giggles when i tickle. My 2 month old grand daughter will stop crying when I start talking to her. But she smiles and gets excited when my daughter in law (babys mom) walks into the room. My daughter loves to cuddle on me when she is tired. My baby loves to attack me with kisses! My 4 month old has found her voice and gets very excited when I am near her. My toddler loves for me to trace shapes on his back while he holds my other hand to his cheek. These moments are the best! My daughter squeals MAMA when I walk into a room! my grannybabies show love by wanting hugs and kiss kiss :). My daughter shows love with big sloppy kisses and giggles! My little one isn’t here yet. 3 more weeks! kelly´s last blog post ..37 weeks ~ Full term! At only six months my son will put his little arms on mine and try to squeeze as hard as he can after I hug him. He also loves to be close and cuddle when he sleeps. My nephews love to cuddle after tickle fights. My little one snuggles when she’s sleepy. lots of before bed snuggles! We don’t have children yet, but are planning to in the very near future. For me it is Baby Reef’s soulful eyes and loving smile! Snuggles and hugs. Her kisses are limited and open mouth. slobbery kisses but I love them! When my daughter is nursing and she reaches up and grabs my face. She usually lets go just enough to let me see a big smile and then she continues nursing. It melts me every time! My boys play so amazingly well together. They love to create and be silly together. My favorite time of the day is the end of the day, when everything seems to slow down and I read my son a story (or 3!) before bed. She randomly comes up to me and gives me long/strong hugs. we love to cuddel and spend mommy and daugheter/son time reading. My 2 yr old always cuddles with me when he is tired. He tells me ‘I love you to the moon’! My son sings himself to sleep. My guy is always smiling. My son just learned how to blow kisses so he blows me a dozen kisses and then giggles as he hugs me. My baby loves giving me sloppy kisses to show her love. For us it is hug, kisses, and smiles. My 3 year old son always asks is everyone okay. When my little guy is nursing, he’ll stop & say, “cudd”. Which is cuddle! Melts my heart every time! My little one runs up to me and kisses my leg. It is the best thing in the world. We spend time outside because going for walk calms him down and puts him to sleep. She’s little and smiles a lot! She lays her face on mine and presses. My babies love their swing! Amy Desrosiers´s last blog post ..Delmonte Fruit Burst™ Squeezers -A Lunchbox Must Have! My little fellow has a favorite stuffed animal, a little dog, that he likes to snuggle to while he sleeps. My little one likes to feed his toys mommy’s milk and hug them! He also shows love with kisses and everyone has to kiss! With the tightest hug in the world. She says it all in her smile..melts my heart.. When my 2 year old grandson is tired, he tugs at his ear and pats his belly. precious! My granddaughter holds her arms out and hugs and kisses you and then smiles so big, she is amazing! My baby boy grabs and chews on the corners of blankets.